Bilbray has accused Peters of also supporting cuts to Medicare and Social Security; Peters has countered that Bilbray distorted his meaning, as ECM previously reported. But the facts speak for themselves. Bilbray has voted to slash funds for Social Security, Medicare and Medicaid. He voted to create a voucher program to replace Medicare and voted to cut Social Security benefits and raise the retirement age, as you can see at these links to his voting record provided at www.StrenghtenSocialSecurity.org. 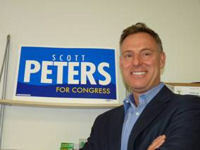 Peters is running to unseat 12-year-incumbent Brian Bilbray in the newly drawn 52nd Congressional District. The hotly contested race is drawing national attention; most recently, National Journal called Bilbray “the most vulnerable incumbent” in California.